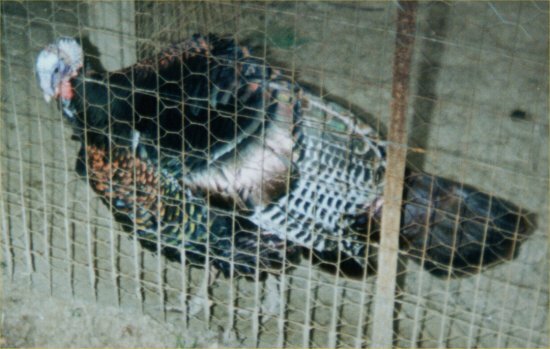 The only known web site on wild turkeys as pets. 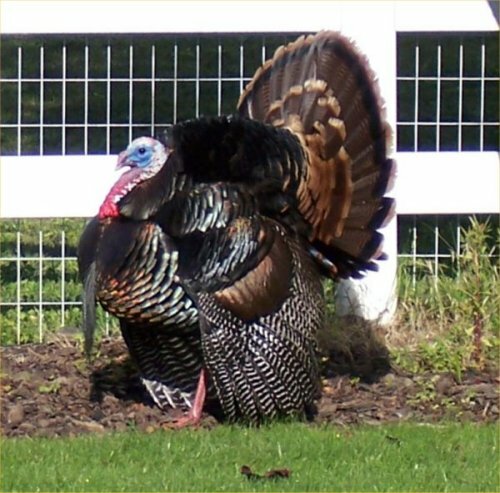 This page now covers both wild and domestic turkeys. A male wild turkey displaying in California. Thanks to Laurie for sending this great photo on 4/29/07. Note: Both of my Eastern wild turkeys are deceased. There are now six chickens in their enclosure. Visit my chicken page for more information. In 1992, we bought a pair of Eastern wild turkeys. Bonnie and Clyde were certainly not your typical pets. They were born on 5/31/92, and we bought them on 7/26/92 for $20 each from a game farm. Bonnie laid her first egg on 3/25/93. Bonnie died 10/19/96 due to a very late total molt and an early cold rain which chilled her to death. Clyde showed no signs of aging until 2000 when he was about 8 years old. He became lethargic and scared of me. Before that, he always wanted to kill me. Clyde's gobbling frequency went down from every morning, all morning February to October 1993-1999 down to once or twice a week for a few minutes in April of 2000. Clyde died on 10/25/00 at the age of 8 years, 5 months. I weighed him. He was only 11 pounds. I think he lost weight over the last year or so. His back spurs were 5/8" and his beard was over 11" long. This section has been moved to the bird shelter page. On 8/18/12, I had my first definite sighting (no doubt and a witness) of wild turkeys on our land! I had previously thought maybe I had seen turkeys three times - once a large bird in a tree out front, one a hen with small poults out front (so long ago, I do not remember the details), and one a large turkey in a pine tree out back. This time, it was a hen and six poults who were probably about 8 weeks old. I first saw the 6 poults in a line down the road and wondered what they might be because they were too big for pheasants and too small for turkeys. Then, I saw the mother only about 30 feet away trying to scare our outdoor cat away. She then ran over to her babies and led them single file across and off our property. There was no time to get a camera. I was telling my brother about the turkeys on 8/30/12. He said he did not believe me until he looked out front and said, "There they are!" The mother and six poults were walking through the front yard and went around the side past my pond and in to the back yard where they went to roost in some large trees. I guess he has to believe me now. I got some photos (not great). I added this section because in the spring and summer of 2002, I was flooded with at least a dozen questions about having found wild turkey eggs or newborns. Before this, I never had this question before. So, I am adding this section so I do not have to retype my answers every time. Ken e-mailed me on 4/3/06 distraught to note that it is illegal to disturb the nest of a wild turkey and/or remove the eggs. This is true. The information below is provided because, despite the law, many people do take wild turkey eggs and/or poults. It is better that, if they do, they have the correct care information, for the sake of the birds. Some of this information is also helpful for domestic turkeys and other birds. If you come across a nest of wild turkey eggs, do not disturb them. The hen will not start to sit on the nest until her clutch is complete so she may not be around at the time you come around. Eggs can sit on the nest for a few weeks without being sat on as long as she does not start the incubation (sitting) process. If flushed (scared) from the nest once she starts incubating, she will sometimes stay away for a few hours or until danger passes. If the nest is cold for more than a few hours, and the hen had started the incubation process, the embryos start to die. If you know for sure that the mother was killed or abandoned the eggs for sure due to human disturbance, then you may feel the need to rescue the eggs. In most cases, this is illegal but you feel you must do good nonetheless. If you cannot find a local wildlife rehabilitator (see my wildlife page for a few places on the internet to search for one), then you really do need to buy an incubator (or put the eggs under a broody bird such as a chicken). Information on incubation is above. See my chicken breeding page for details on incubation, candling, hatching, and rearing. The information is almost the same for poults except for the incubation time is 4 weeks instead of 3 weeks. One problem with trying to hatch eggs taken from the wild is that you have no idea how long ago they were laid or incubation begun by the mother. So, you have no idea when to increase the humidity and stop turning in anticipation of hatching. One way to estimate how far along they are is to candle them. My chicken page has information on how to do that and links to sites with photos of candled chicken eggs (multiply the dates they give by 4/3; for example, day 10 for a chicken is day 13.3 for a turkey). A few people who e-mailed me used an incubator on the eggs they found and did not get any to hatch because it is hard! One guy had an ideal setup and got about 10 that were full term but failed to hatch, probably due to improper humidity. I went through 50 fertile chicken eggs (6 grew full term) and four incubations and finally got one to hatch (my precious Beebee). Do not be disappointed if the eggs die. Many others used just an incandescent bulb or other light or heat source. These could never be expected to hatch as it takes a constant, exact temperature and humidity to get eggs to develop and hatch. A bulb simply will not work. Lots of people have since e-mailed about turkey eggs they have gotten from the wild. One person got half a clutch to hatch under a chicken hen. Another got one poult from an incubator. A few did not have any hatch. It never hurts to try! A few people found young poults and a dead mother or believed she had left them due to human disturbance. If the mother was scared off, she should return if you leave the area. In some cases, the poults are obviously on their own. Again, it is most likely illegal to capture the babies but kind-heartened people feel they cannot just leave them there. If the poults are able to escape you, they are probably old enough to survive on their own (about 3 weeks old or more) as long as predators do not get them. If you can catch them, then try to find a wildlife rehabilitator in your area (again, see my wildlife page). In the mean time or if no one to help can be found, the babies can be fed on turkey starter (may be called market bird starter) from your local farm supply store. In addition to this grain mix, they can eat small amounts of the following: live earthworms, mealworms, crickets, bugs, beetles, spiders, and other small critters you find as long as they have not been exposed to pesticides or herbicides; finely chopped up grapes, kale, spinach, apples, most greens, etc. ; grated carrot; oatmeal; etc. For more foods to try, see the section on feeding adult turkeys and also the section on feeding chickens. Poults can eat the same food as long as it is finely chopped. One person suggested that putting a nickel in with the grain will get poults to start eating since they like to peck at shiny things. Keep the poults at 95 degrees F for the first week and then lower the temperature by 5 degrees weekly. Get a brooder lamp from the feed store or a heating lamp to keep them warm. Do NOT keep poults on plain newspaper for the first week or they cannot stand up. Put paper towels or hardware cloth over top of the newspaper for the first week. Change the paper towels twice a day. Always provide fresh water with a chick waterer. If you must use a pan of water, make sure it is very small so the poult cannot drown. It is to be expected that the poult will walk in, spill, and generally make a mess of open water dishes so a chick waterer is almost a must. Hopefully, you will never have to take in a wild poult so they can remain in the wild but, if you do, this information will help. Wild turkey poults if raised by humans become pretty much domesticated. They usually will have no desire to return to the wild so keep that in mind. A wildlife rehabilitator will make every effort to reintroduce poults to the wild. You may not have such luck and could end up with (an illegal) pet for up to 10-15 years. As it is legal to buy wild turkey eggs and poults from a game farm (bird supplier) and keep them in most cases (legal to keep but not release), this is not that much different as far as how the poults are raised and kept. Just do not tell people who you do not trust that you have actual wild wild turkeys. Be sure to also visit my turkey photos page!